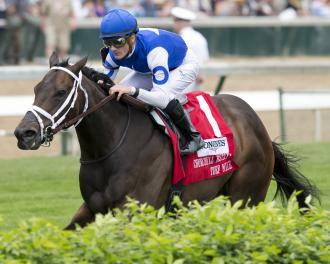 As the champion Tepin powered clear in the lane of the Churchill Downs turf course en route to a repeat victory in the Grade 2, $300,000 Churchill Distaff Turf Mile – a performance that launches her to Royal Ascot – a sizable group of her connections, barn staff, and admirers standing trackside erupted. There was no shortage of celebratory embraces. But as he walked out onto the track to meet his star racemare, trainer Mark Casse’s thoughts turned to someone who was no longer there. Tepin, with Julien Leparoux aboard, wins the Distaff Turf Mile by 3 1/2 lengths Saturday. That's high praise coming from the multiple Sovereign Award-winning trainer. But Tepin, who has now won six consecutive races and is only a nose and a head from being unbeaten in the past year, has earned it. Tepin's winning streak includes four Grade 1 victories, highlighted by a win in the Breeders' Cup Mile, and she pushed her earnings past $3 million with Saturday’s victory. Casse gives much of the credit for Tepin’s success to son and top assistant Norman, named for his late father. “Norman's done a great job with her,” Casse said. “She doesn't train like the average horse. Everybody looked and said, ‘She worked so slow,’ and someone came up and said, ‘Are you worried?’ And I said, ‘Don't worry, that's her.’ She's learned to relax. Tepin ($2.60), the heavy favorite in the field of seven for the Distaff Turf Mile, broke cleanly from the rail and saved ground the whole way as the free-wheeling Isabella Sings spurted clear early, leading by 3 1/2 lengths through a half in 46.06 seconds. Regular rider Julien Leparoux gave Tepin a nudge rounding the far turn, and she willingly began to reel in Isabella Sings. Tepin struck the lead entering the stretch, and the outcome was never in doubt from there, as she widened to a 3 1/2-length victory under hand urging. The final time for the mile was 1:34.36. Rainha Da Bateria, who was last early, rallied to be second by three-quarters of a length over Cash Control. Tepin has been invited to participate in the Group 1 Queen Anne Stakes at a mile on opening day of the renowned Royal Ascot meeting on June 14. Casse said he has already done some research as far as preparing to ship the mare overseas and will consult with trainers Graham Motion and Wesley Ward, both of whom have competed successfully at Royal Ascot in the past, for additional advice. Still, the trainer is not worried as far as Tepin’s ability to adapt.